It's only been a couple weeks since Slotland.com had their last major jackpot winner and their famously regular progressive jackpot has already been hit again, this time for $108,060 (€78,550). Just last month the all-slots-and-video-poker site announced a $168,947 (€123,000) jackpot win. A player known as MSMIKEY was playing the popular “Jacks or Better” video slot when she struck it rich on her 134th spin that night. MSMIKEY has been a regular player at Slotland.com for almost two years. 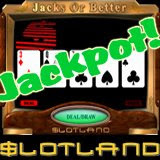 Although all slots and video poker games on Slotland’s mobile casino site are connected to the same progressive jackpot as their web games, MSMIKEY was playing on her home computer when she got lucky. For years, Slotland’s progressive jackpot has been hit quite regularly. The site has announced a major winner every six weeks or so, always for over $100,000. It had taken longer than usual for the last win, but MSMIKEY’s win puts the notoriously regular jackpot back on schedule. Slotland’s biggest jackpot winner ever was a lucky Canadian player that won $195,083 (€126,910) in March. A player known as TOPNOTCHED had held the record prior to that for their $179,166 (€130,180K) win on the “Golden 8” slot machine last May. So far, the biggest jackpot win on a mobile casino game was the $163K (€116K) that “OLYMPIAGOLD” won playing the mobile version of “Lucky Stars” in early 2006. Slotland.com features seven unique slot machines and three video poker games. Four slot machines and two video poker games are also available on mobile phones and PDAs.